Tony and Emmy Award-winning Broadway favorite LaChanze makes her Bay Area concert debut to close our season on Sunday, May 5, 2019. She'll perform her powerful autobiographical show, The Feeling Good Show, which originated at Joe's Pub and was a hit at venues like The Cabaret in Indianapolis and New York's Highline Ballroom. LaChanze earned her first Tony nomination in her first starring role on Broadway, playing the central role of "Ti Moune" in the original 1990 production of Once on This Island. She won the 2006 Tony Award for Best Leading Actress in a Musical for originating the role of "Celie" in The Color Purple, and returned to Broadway in 2014 in the musical If/Then with Rent stars Anthony Rapp and Idina Menzel. Among her many Off-Broadway credits, she starred in Bubbly Black Girl Sheds Her Chameleon Skin. 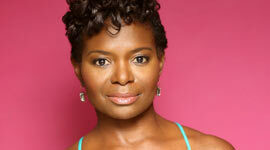 In 2009, she won an Emmy for her performance in PBS Great Performances of Handel's Messiah Rocks! with the Boston Pops orchestra. LaChanze currently stars as "Donna Summer" in Summer: The Donna Summer Musical, for which she recently earned a Tony nomination for Best Leading Actress in a Musical.